So Saturday was a strange but useful day, to be been contemplating a change from my Fiesta ST M-Sport which I’ve been using as a daily the last 3 years. I toyed with a U.K. Edition WRX Subaru , Focus RS and different variants of the Golf GTI. I had thought my ideal spec would be a 3 door solid white Clubsport 40. But during a quick visit to my local VW Dealership I fell in love with their demonstrator a late 2018 Isaac Blue GTI 3 door on Bresicas and Art Velour Interior. It reminded me of a 2005 mark V Blue Graphite that I ran for 2 1/2 years whilst living in France ... a brilliant car that used to do everything so well with a man minimum of fuss yet come alive on a mountain pass when the mood took. Normally I travel a long way to buy a car or wait a good deal of time for it to arrive. But I took a pretty quick decision to go ahead on this 3 door and look forward to picking it up next week. An excellent choice sir, in particular with the colour and the wheels. However - pics or it didn’t happen. Just be very careful with washing etc, Isaac Blue is a very very soft paint. Gah! I specifically avoided a solid paint and went for a metallic for exactly this reason. With my black A3, using snow foam, micro fibre mitt and the two bucket method wasn’t enough. It still looked like I’d washed it with a bag of grit and a Brillo pad. Must be the eco friendly paint they use these days, plus putting thinner layers on to save money/recoup Dieselgate costs. Isaac Blue is no softer than any other colour in the palette. When my detailer measured the depths and machine polished my car last month he said the paint was standard durability and needed the same levels of abrasion as other VAG paints, he didn't need to go a grade softer or harder. 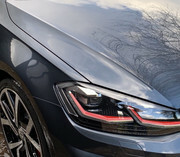 Soft paint on Golfs is normally found on anything that is painted in gloss black, so on the R it's all the bumper/window trims, mirror caps etc. The only thing is that from 2017 onwards there's about 40% less paint used on the cars than in previous years! The paint on my 2017 Tornado Red GTI was a lot harder, as confirmed by my deatiler when it went in for some work. Agree, solid and metallic / pearlescent coloured cars will all have primer, base coat and lacquer and go through the same painting process so the ‘hardness’ should be the same irrespective of the colour. Begs the question why VW charges more for metallic paint over a solid paint. The exception may be pearlescent Oryx White, which has an extra stage in the painting process - a separate pearlescent layer applied to a Pure White base coat before the lacquer coat is applied. Assume this extra stage in the painting process is the reason for the significantly higher cost of Oryx White paint. VW paint always used to have a reputation for being hard. Maybe modern water based paints mean this is no longer the case, although I’ve machine polished the last two VW’s I’ve owned - both with water based paint - and would say that the paint does seem quite hard. Maybe on a brand new car the paint hasn’t fully cured when the car leaves the factory, but it continues to harden more over time. Soft paint on Golfs is normally found on anything that is painted in gloss black, so on the R it's all the bumper/window trims, mirror caps etc. Pretty certain that the piano black B pillar trims are a gloss black plastic and not actually painted. Whatever the finish is, they are very soft and very prone to swirling. I have Isaac blue. Despite my best efforts- lambs wool mitt/ 2 bucket etc- haven’t been able to avoid some very light swirling. Only visible on close inspection and in certain light, but i was surprised nonetheless- given how careful I felt I had been on washing. I think that even with a good washing technique, light swirling will happen over time. A good washing and drying technique will minimise it though. Lighter colours are no less susceptible to swirling than dark colours. It’s just that swirls are much more noticeable on darker colours, especially in certain lighting conditions. Fact - darker shades of blue are a nightmare for swirls. Isaac must the most popular GTI colour currently! Despite grey been the top UK colour.